‘Tis finals time here on the old factory floor. For those of us working with a student body that is largely first-generation college attendees we’re watching some especially critical dice rolls. Will students choose to focus on their final assessments? Will they be able to rearrange their work schedules to spend the extra time making sure they’ve got everything done? Will various children and other family members stay well enough not to jeopardize study schedules? If the answer is yes, they will be likely to pass their courses and enroll in another semester, whittling down the requirements on the way to a four-year degree. If the answer is no, they might not pass. They might not complete enough of their courseload to qualify for another semester of financial aid. They might not feel that they’re progressing quickly enough to be worth all of the sacrifices they’re making, all of the debt they’re accruing, all of the sleep they’ve lost and bosses they’ve pissed off. The end of the semester is when they decide to throw in the towel. What I know, and what is not commonly enough known, is that these students are making decisions for all of us. These are the students who will increase our total pool of educated Americans – an outcome we all desperately need in order to complete our transition to a globalized economy. The students who will add to our collective educated workforce are not the students whose families would always ensure that they would complete college. It’s the students who are doing something different than their parents did, because they hope it will give them a better future than the one they’re looking at right now. And to do that, they have to gamble with their own credit, and with a bill that’s many magnitudes higher than any that they’ve seen before. At higher family income levels, college finances are mainly managed by students’ parents. In the world I work in, this is not the case. Generally, we talk about entering into debt as a choice – and often a morally distasteful one. Debt has long philosophic associations with guilt, and modern debt-counseling services associate debt with immature traits like impulsivity and irresponsibility. However, for students whose families do not have the means to pay for college, they face a financial catch-22: either they assume a large amount of debt, or they face increased likelihood of a lifetime of low earnings and frequent unemployment. These are two unpleasant options. 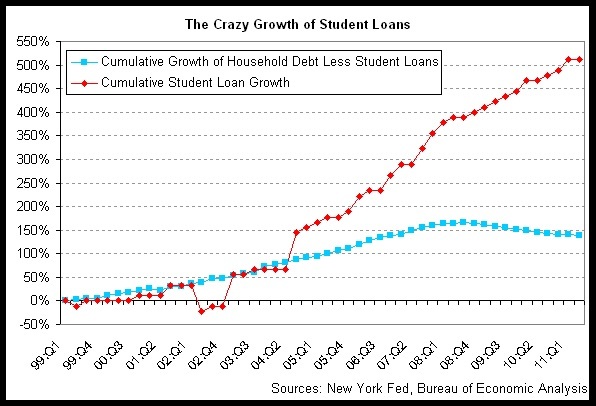 What’s also too bad is that when students choose not to assume the personal debt, society at large loses. When an individual takes on that debt to complete college, we all gain an additional college-educated member of our community. We gain in collective skills, our location has additional skilled labor to attract employers, our unemployment rate and crime rate are likely to go down, and a “virtuous cycle” is initiated whereby the children of that person are also more likely to go to college. This virtuous social outcome of the individual’s sacrifice is known in economics as “external benefit“: society at large benefits from an individual’s private actions. It is the job of governments to help markets “internalize” these benefits so that we get socially optimal outcomes. It benefits all of us, collectively, to have everyone who wants to complete a college degree do so because of the strong collective benefits to increasing our proportion of college graduates. The way that we have historically recognized this public benefit of higher education, and sought to support it, is through state-subsidized higher education. Unfortunately, despite our crying need for more high-level education completion in this country, we are doing less and less of this. 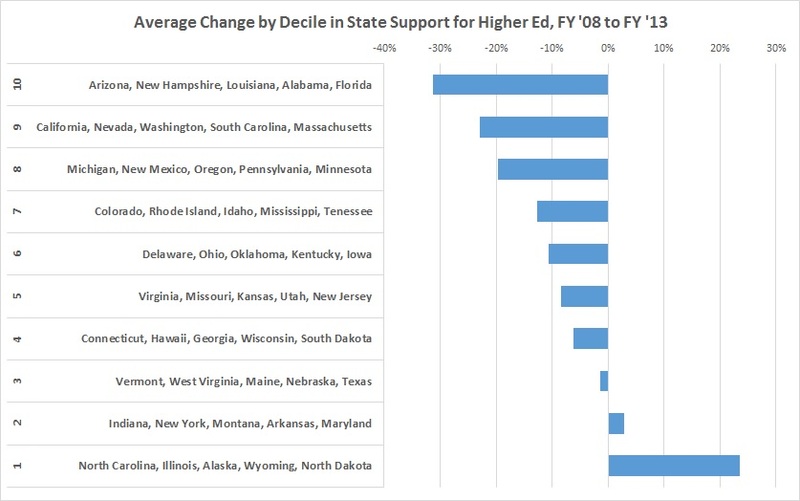 Between 2007-2008 and 2012-2013, 38 of the US states decreased their spending on higher education. Of the remaining 12 states, only 4 — Illinois, Alaska, Wyoming and North Dakota — increased spending on higher education at a rate that exceeded inflation. Data from the Grapevine Annual Compilation of State Fiscal Support for Higher Education, http://grapevine.illinoisstate.edu/index.shtml. In many states, the only way to make up for these kinds of cuts has been to dramatically increase tuition levels. In Arizona, tuition at the state’s public universities nearly doubled (91%) between ’07-08 and ’11-’12. In California, during the same period public tuition rose 77%. (This is a particular tragedy since California has over 9.2 million potentially college-bound children, the highest number of any state in the country.) Only a handful of states saw an increase in tuition rates of less than 20% during the FY 08-FY 13 period. How have students collectively responded to this? Undoubtedly, by attending college in lower numbers than they otherwise would. For those who do attend, they take on more personal debt. Educating students under these conditions, their debt swirls around us like a kind of ethical test. Are we giving enough value? Is their investment worth it? I take this responsibility seriously and try to be sure that whatever I do, I am leaving them more employable, more savvy about what they can do to improve their chances. But the real ethical test concerns our collective responsibility to the people who will be – or who will not be – bringing our country out of economic stagnation. When we cut support for higher education, we collectively decide to rest more and more of the weight of our transition on the shoulders of underresourced young people. And maybe they’ll make it, and maybe they won’t. But we should all be more aware of what we’re implicitly asking from them at a social level. For those who try despite the high price tag, we should understand that students’ willingness to sacrifice their own money, uncertainty and financial risk actually puts us in their debt. It is hard to believe that in an economy such as ours, we would neglect to support higher education. We talk about making personal investments to survive in retirement, but we can’t support the future of our country through supporting higher education?